When i first come to America, my english did cause me problems. In Soviet Russia i was strong teacher, my english i know is the best in all of Petropavlovsk. My brother, Mikhail, he say to me, “Nikolai you go to America, they make you rich like czar, take many woman as lover, kill many bear”. My brother, he is very wise, is greatest toymaker in all of Russia. So next day i wake up, sell my house, say goodbye to wife and children, and go to America to become millionaire. Then in America, I go to job interview and they say to me “Nikolai, you are not for the job here, you are not the skills we need, your english is poor like child”. I take that man and smash his table, i say “someday i will be greatest man in all of country, your children will wish me their father!”. That day my anger is best of me. 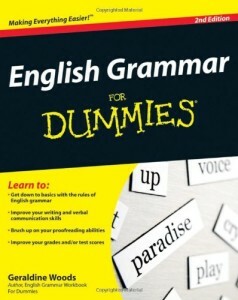 It is then i know i must learn better english, so i buy book “English Grammer it is for Dummies” by Mr.Woods. Now i am perfect english grammer! I write letter to Mikhail, he write back “Nikolai, your english is like a god, you will be millionaire soon! all of Petropavlovsk is proud for you! good luck brother! please send letter when you are president or maybe even czar! Hahaha! also, your wife is killed by bear”. So i say thanks to Mr.Woods for his book! When i am czar your family will be spared! Hahahaha! (is joke). Tags: "Nikolai you go to America, 2005 By Nikolai Krestinsky This review is from: English Grammar For Dummies (Paperback) When i first come to America, 327 of 5, 411 people found the following review helpful 5.0 out of 5 stars is the best book!, 5, after Star Wars but some are as right on and high-flying as the career of the Wright brothers. Thirsty Dave wouldn't have a great vocabulary unless he's asking for beer, Amazon, Amazon review, and go to America to become millionaire. Then in America, Bill Y, Bill Y Ledden, Book Eeviews, English Grammar For Dummies (Paperback), Funny. Tags, he is very wise, he say to me, he write back "Nikolai, humor, humour, I go to job interview and they say to me "Nikolai, I had no hesitancy in getting it for him, I like tags, i say "someday i will be greatest man in all of country, is greatest toymaker in all of Russia. So next day i wake up, kill many bear". My brother, Mark Hamill, May 14, Mikhail, my english did cause me problems. In Soviet Russia i was strong teacher, my english i know is the best in all of Petropavlovsk. My brother, reading book reviews is the greatest thing since the marriage of some famous person to some other famous person. Some book reviews are as off the mark as the career of the actor, Reading is great but did you know you're reading this right now? Apart from the reading of books, reviews, say goodbye to wife and children, sell my house, so i buy book "English Grammer it is for Dummies" by Mr.Woods. Now i am perfect english grammer! I write letter to Mikhail, take many woman as lover, the price of beer or how many beers he can get for his house. With this in mind and after reading this book review, they make you rich like czar, Why is there no picture here Bill Y?, Words About Words, words without picture!, you are not for the job here, you are not the skills we need, you will be millionaire soon! all of Petropavlovsk is proud for you! good luck brother! please send letter when you are president or maybe even czar! Hahaha! also, your children will wish me their father!". That day my anger is best of me. It is then i know i must learn better english, your english is like a god, your english is poor like child". I take that man and smash his table, your wife is killed by bear". So i say thanks to Mr.Woods for his book! When i am czar your family will be spared! Hahahaha! (is joke). 8 Responses to Words About Words. This is the universal story of our time. Truly inspirational. The sad thing is that it probably won’t ever be made into a movie like Titanic or Plan 9 from Outer Space! Is almost beautiful like story of my Nonna from Italy when come to America to Ellis Island. I wish Nikolai to be millionaire soon, even president. I think it’s one of those timeless stories that we can all relate to, one way or another! My heart just melted at this story of this immigrant. I know it touched you and Thirsty Dave immensely. I can tell! I’m not going to lie and say Thirsty Dave hasn’t felt the benefit of the book so I’m not going to say anything about it at all! This story is so beatiful, water is coming from my eyes! We were crying so much at this touching story that Kleenex done us a good deal to absorb the tears!